Time to whip out some of my drugstore loves, after the recent features of high-end products! 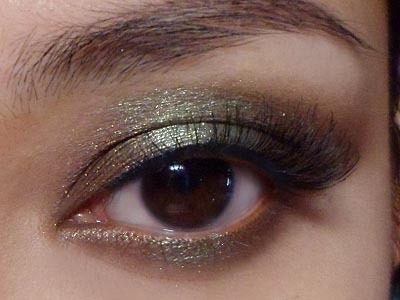 Since I've been on something of a green kick recently, L'oreal Color Infallible Shadow Permanent Kaki (which had up to now been passed over repeatedly when I played around with the testers at the drugstore) suddenly caught my eye. Now, let me first tell you not to trust what you see in the pot. The beauty of this beautifully-metallic sage-green gem only comes out when swatched on the skin. Step 1: Because the best way to pack this binder-rich shadow (it's somewhere between a loose pigment and a cream) is to use your fingers, work it on gently in the outer 1/3 of your lids, going up just to the socket line but no further. Step 2: This is where a brush comes in. Take a fluffy brush and quickly start blending the brown straight outwards into a wing. The binders in this shadow will set after awhile, so the faster you work, the easier it will be to blend. Step 3: Using a flat brush, apply the brown to the lower lash line as well, pulling it out to meet the bottom of the wing. Step 4: With your finger, carefully dab some shadow onto the inner corners. I'd usually use a brush for precision, but because it doesn't go on well with a brush, I used my hands. Just be very careful not to smudge any shadow all over. Step 5: The star of the show is the green, but you won't need to use that much of it. I just gently patted it around the center of the lids and outwards lightly into the brown. Don't rub back and forth or you will muddy up the green and the brown. You want the green to stay very rich and "pure". Step 6: Don't forget to dab a little onto the center of your lower lids as well, BUT if you have very prominent bags under your eyes, you might want to skip this, as applying a lighter shade in the center of the lid emphasizes contours more. Step 7: For a touch more drama (but not too much), I applied natural-hair lashes (Ardell Wispies). this is so simple to do yet it looks complex. so effective. LOVE the khaki colour! !